For a voice that comes to life, facilitates comprehension and captures the listener, it is essential that your educational materials haves. An audioguided tour offers information on your museum or tourist site to your audience, all by giving providing the liberty to change it at their leisure. A professional audioguided voiceover adds an attractive aspect and non-negligible dynamic to the visit. Liven up your courses and visits! 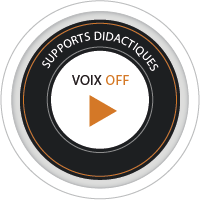 Discover some of Guy De Hainaut’s creations in the areas of educational or audioguided visit voice over.